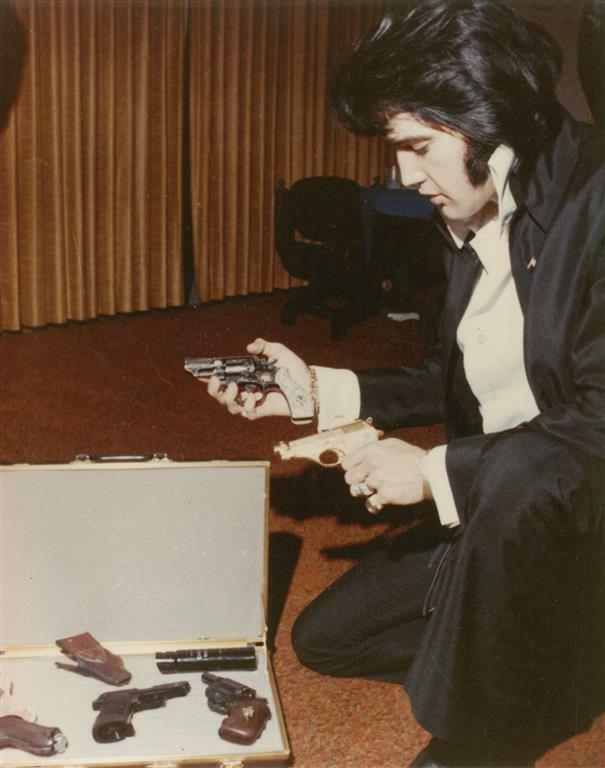 Elvis Presley had good taste in revolvers. He was a “US male” before he became a rock and roll star and he grew up in a nation that, at that time, was strongly patriotic, and which held high moral standards. Elvis was also drafted into the army and served overseas so he was also subject to the discipline, values and attitude training that well delivered military service imparts. This stayed with Elvis even as the culture of the United States changed in the post war era and Elvis himself was caught up in those changes, changes that were not positive either for America or for Elvis. Yet Elvis retained his sense of loyalty to those who looked after him and he also kept a deep respect for, and friendship with law enforcement. A large measure of responsibility for those negative cultural changes can, I believe, be laid firmly at the feet of an entertainment industry that seemed determined to trash the old culture and bring in a new hedonistic and self destructive culture, one that the western world is still reeling from the effects of today. When Bob Dylan sang “The times they are a changin’…” they were not generally changing for the better, although Dr. Martin Luther King Jr. and a notable few others were determined to make them better. Elvis was caught between two conflicting worlds, the world of the United States that he’d grown up in, and whom he had served during his army days, and the self centered hedonistic world of the entertainment industry. Elvis Presley had good taste in revolvers as his choice of a Colt Python demonstrates. The engraving work is superb, note how alive the animals look. Elvis Presley in his younger days was an imaginative lover of life. Two of his revolvers that are coming up for sale by Rock Island Auction in their May 2017 Premiere Firearms Auction are outstanding in that they are not only intelligent choices for the makes and models chosen, but the engraving work on each piece is superbly alive. These revolvers have a character in their art work that is not often encountered. These were not revolvers that Elvis intended to keep. Each of them was presented to someone whom Elvis respected, people he believed he could trust. Right side view of the Colt Python. 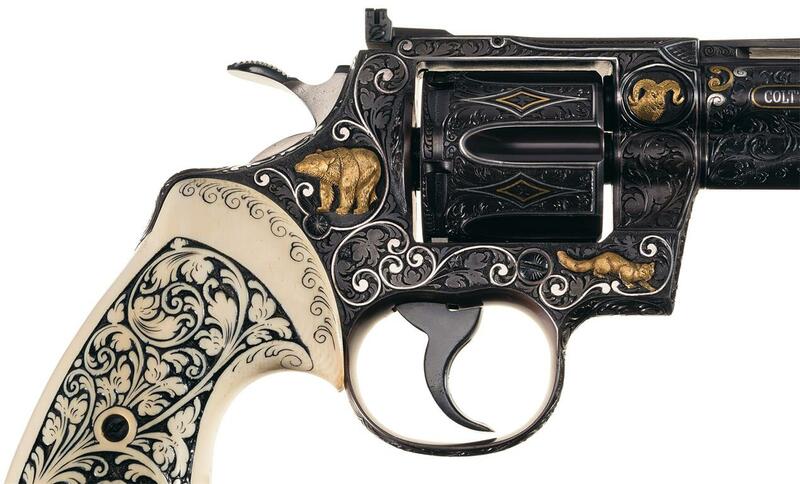 Brilliant art work on one of Colt’s greatest revolvers. 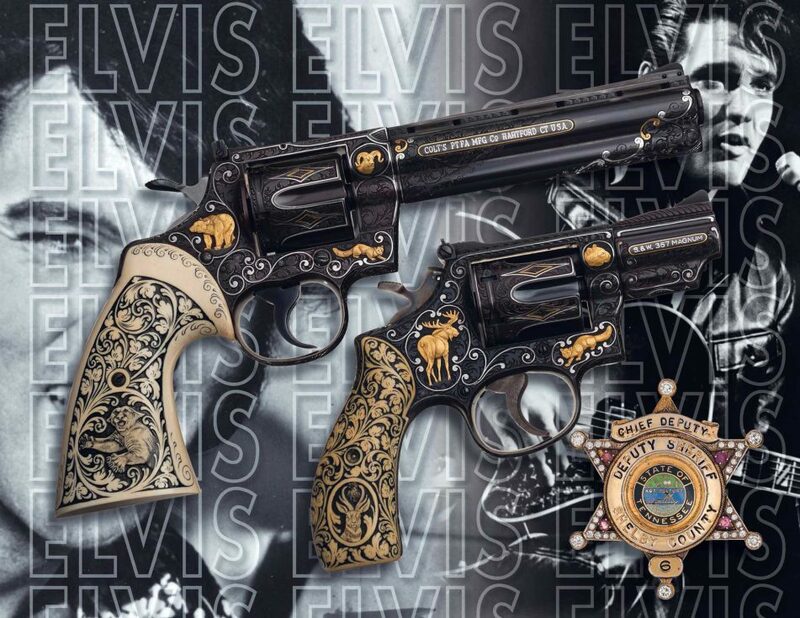 The Colt Python revolver in the pictures above Elvis presented to Richard Grob, the Director of Security and Operations for Elvis Presley Enterprises. Richard Grob was not just an employee but was a friend to Elvis, advised him on firearm purchases, and accompanied him to the shooting range to enjoy those purchases. Richard Grob worked with Elvis from 1967 until Elvis death in August 1977 and was a Sergeant with the Palm Springs, California, police department. I wonder if Elvis ever introduced this revolver with the words “I’d like to introduce you to my friends; Smith and Wesson”? The other revolver is a Smith & Wesson Model 19-2. 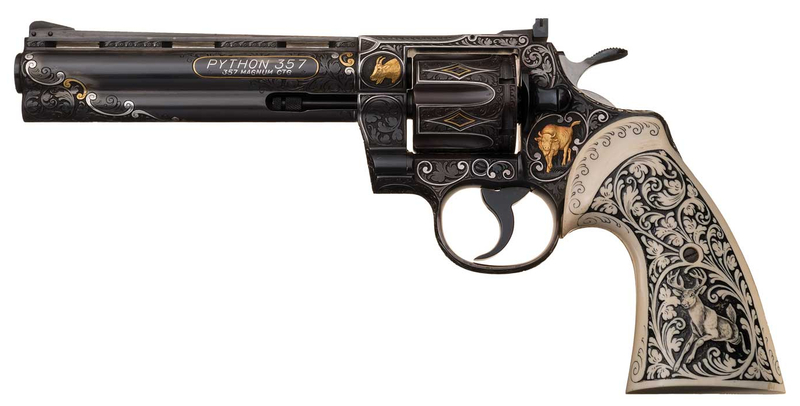 Also in .357 Magnum this revolver had its engraving work done by the same people as the Colt Python, master engravers at the German gun-maker Friedrick Wilhelm Heym Co. (Note: This link takes you to the US website). F.W. Heym (Note: This link takes you to the German website) are still in business making superb rifles and combination guns, and their engraving work is to this day second to none. 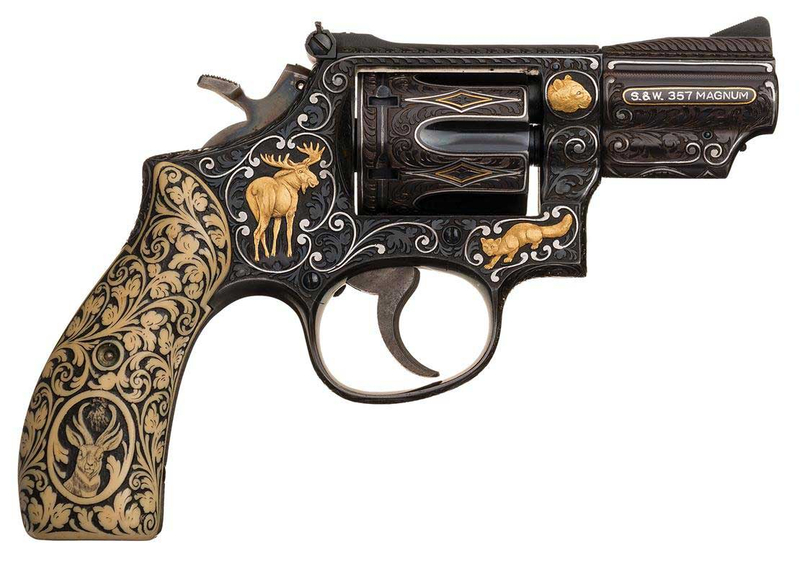 Right side view of the Smith & Wesson Model 19-2 showing the superbly lifelike engraving work done by master engravers of Friedrick Wilhelm Heym Co. in Germany. 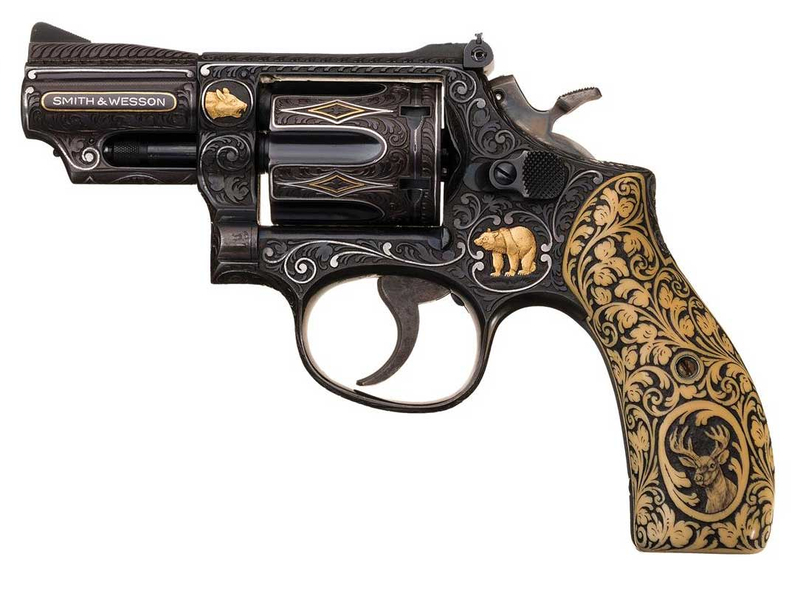 The Smith & Wesson Model 19-2 is a revolver Elvis originally presented to Richard Nixon’s Vice President Spiro Agnew. Events subsequently led to Spiro Agnew being forced to resign his Vice Presidency and he returned the beautiful Model 19 to Elvis. The revolver would not be long in Elvis hands however and one night some of Elvis friends who were coming to visit him at Graceland were stranded at the airport. Elvis did what most of us likely would not do, he called the local sheriff, Gene Barksdale, and asked him if he wouldn’t mind picking up his friends. Elvis had great respect for law enforcement and had a close relationship with them. He was generous to them providing cars, uniforms for sports teams, and assistance with the funeral expenses for a fallen officer. When Sheriff Barksdale dropped off Elvis friends at Graceland the two got chatting and Elvis said “Well, sheriff, I got something for ya.” and proceeded to present him with the engraved Smith & Wesson Model 19-2 that he’d originally given to Spiro Agnew. 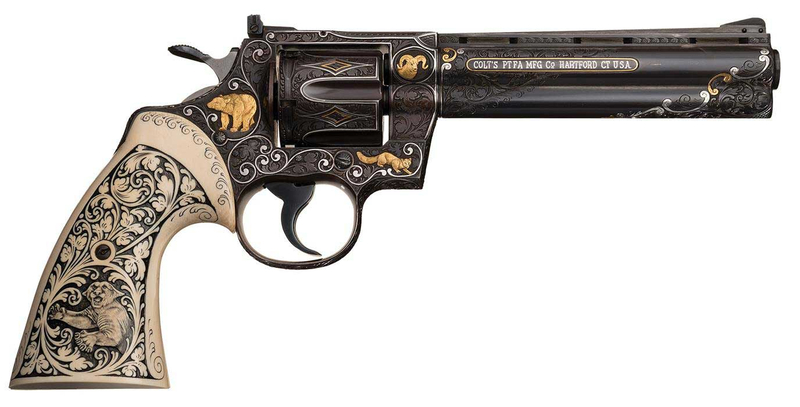 This close-up of the Colt Python helps us appreciate the beauty of the F.W. Heym engraving. Each of these revolvers has a story to tell. Each of them is associated with a man who is still called “The King of Rock ‘n Roll”. Each of them is an outstanding work of art and that is completely appropriate. They were commissioned by a man who was not just an artist, but a larger than life artist, and above that a man who loved people and loved life. Elvis has passed but his memory lives on. His life remains symbolic of a period of American history that will likely be remembered as a time of tragedy. Whether America will realize what is needed and to restore what has been lost remains to be seen. We hope she does. These two revolvers are coming up for auction by Rock Island Auction at their Premiere Firearms Auction to be held between May 5th-7th, 2017. You will find the information page for this auction if you click here.